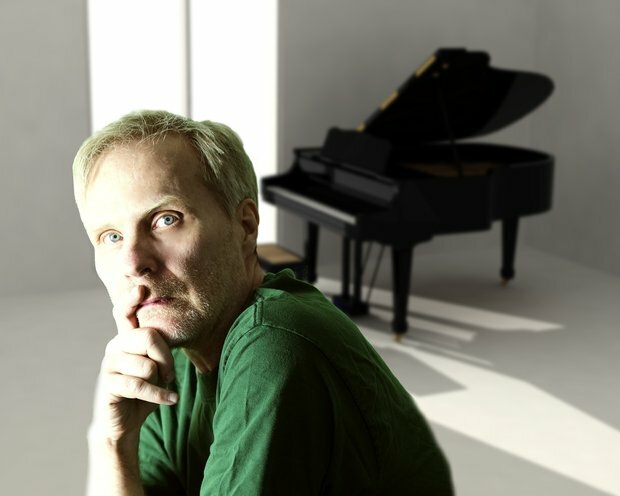 Anders Helmerson "Quantum House Project"
Anders Helmerson is the artist who has been known as a prog fusion composer and cult keyboard player since his sold-out first album "End Of Illusion" (1981). He has previously released 3 albums, the most recent Triple Ripple was released in 2011 where he collaborated with German drummer Marco Minneman and American bassist Bryan Beller. One thing: Anders has put his electronica behind and plays acoustic grand piano in collaboration with his new trio. This new outfit came as a surprise to many with what it have conceived and many fans was disappointed but he has now gained many new listeners. He still underline that the type of music he is composing now does not differ much from before although the timbre is different. And due to this timbre the music he produces has suddenly become accepted in the jazz venues. The setting grand piano, drums ( played by Christian Grassart ) and electric bass ( played by Thierry Conand) makes the outcome feel more jazzy and organic. The music is energetic and loud but at the same time lyrical sensitive. The new trio, named by Anders as "Quantum House Project" is now playing live shows in UK and France. Following by the successful live show at Vortex Jazz Club in London, UK on 4th September 2018, the new album will officially be released on Saturday 3rd November 2018 at PizzaExpress Jazz club in Soho, London, UK at 1PM for a new album release launch party with Anders solo grand piano teaser performance as the background music for the industry networking. The name Quantum House eludes to the modern science of quantum mechanics that has been a source of inspiration for Anders when he wrote he music and titles as Superposition and Entangle reflects his philosophy in terms of how nature influences the creative process of writing music. Prior to the album version, the single Entangle in now on the major music download and streaming services such as iTunes, Amazon, Spotify, Google Play and so on. The new album "Quantum House Project" will be on sale for worldwide distributions on 3rd November 2018.